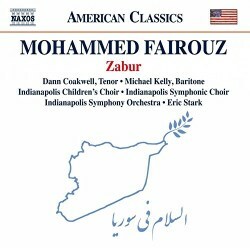 The title Zabur is the Arabic word for Psalms, but this oratorio is very much more than simply a series of liturgical settings. Instead it addresses serious moral issues: in particular, is the creation of works of art about scenes of death and destruction warranted, and can such works transcend their origins to attain a higher stature? The composer himself in his booklet note draws a parallel with Britten by describing the work as “a sort of war requiem” and indeed the whole thesis which underpins it addresses many of the same concerns as that pioneering masterpiece. There are also musical parallels. The liturgical settings of the psalms (sung in Arabic) are assigned to the chorus, which include a children’s choir as well; and these sections are set in contrast to dialogues for tenor and baritone soloists in English. Unlike Britten’s use of poems by Wilfred Owen, however, these vernacular texts by Najla Said (born in 1974) are decidedly more prosaic including passages which would appear to defy musical enhancement: “Perhaps we could all participate and help you?”, to take one example. It says a very great deal for Fairouz’s identification with the words that he manages to transcend the occasional banalities to produce music of real emotional warmth and stature. “Only a melody can render such fears” is one of the more poetic phrases of the libretto (which is highly dramatic in its construction) and such an implicit challenge might stump many composers whose avoidance of melody is one of their chief tenets in the setting of words. Fairouz rises to the challenge and revels in it. Melodic phrases recur identifiably throughout the score and are enhanced on each repetition. One such example occurs in Part Two, where the solo baritone line “In the beginning you laid the foundations of the earth, and the heavens are the work of your hands” develops into a duet between the two male voices and then gathers orchestral richness as the tenor declaims it at the climax which concludes track 9, before it returns once again as a transcendent and more ethereal chorus at the end (track 16). The fact that this emotional development can be clearly discerned on the very first hearing is a tribute indeed to a work which is otherwise largely couched in the post-minimalist idiom we associate with composers such as John Adams. And Fairouz shows more feeling for the natural rise and fall of the English language than Adams often demonstrates, even when his repetition of lines of text sometimes seems to be motivated more by musical than dramatic considerations. He might have been helped even more by greater engagement from the performers. Although the children’s choir (track 10) manage to deliver even a line like “I would like to have some chocolate” with tenderness, elsewhere the solo singers occasionally mangle their vowel sounds and sometimes give the impression that they would have liked a little more time to expand into the lyrical upper reaches of their vocal lines – the climactic repetition by Dann Coakwell of “In the beginning” is one such point. One appreciates that this recording appears to derive from a single public first performance of the work, but perhaps a subsequent studio session might have helped conductor Eric Stern and his performers to relax a little more, to the benefit of the expressiveness of the music. But this is probably seeking a degree of luxury that recording sessions cannot nowadays afford. As it is one should be grateful for the fact that the performance is as overwhelming as it frequently is, and for the excellent quality and balance of the recorded sound. And also for the fact that the Indianapolis chorus saw fit to commission such a work, at a time when Donald Trump was already beginning to unleash his rhetoric against Islam and the immigration of Muslim refugees into America. This oratorio is a timely reminder of the horrors that have been engendered by the failure of US foreign policy in the Middle East and deserves support on those grounds quite apart from its artistic merits. Steve Arloff on this site has already praised the music highly, and rightly so; his review gives greater details on the actual scenario of the text, and I will not repeat these here. He does however mention that the text is not printed in the booklet, only being available from the Naxos website; my copy of the booklet does contain the text, although a couple of phrases (immediately before the first statement of “In the beginning”) appear to be missing. In that text the words of the psalms are printed only in Arabic script, which makes it somewhat difficult to keep track precisely of where the listener is; but then Fairouz’s musical setting clearly reflects what the chorus is actually singing about. This is a most welcome issue, and a marvellous discovery of some really gripping and effectively written new music. One hopes that further performances will follow (the Indianapolis forces took their version to New York in October 2016), and perhaps in due course a recording under studio conditions where the gratefully written vocal lines will be allowed more room to expand. But those who wish to discover a work written from the heart, and which speaks to the heart, need not hesitate.